1. The methodology depends on the final aim of the exercise. 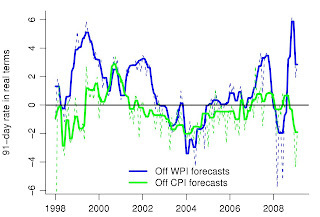 ARMA forecasting of inflation is lame as you rightly point out. As is any other multivariate forecasting. And it is not even a good first cut. Forecasting inflation using a model is different from knowing how people at large are forecasting inflation. Unless we can show that the output of any forecasting model proxies inflation expectations, the methodology does not serve the economic purpose. The TIPs vs. nominal market is only one indicator and not totally reliable. And even that can be problematic because nominals are more often than not, more liquid. 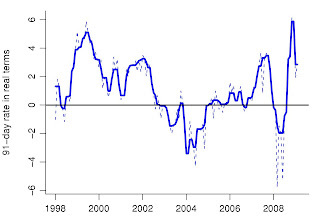 Also, there is the inflation risk premium which biases the estimates from inflation-linkers. We need good survey based measure of long-term expected inflation. 2. Even if we assume that the ARMA model is a good approximation of the people’s expectation formation process, 3-month expectations are not what policy makers worry about. Monetary policy is mainly about stabilizing long-term expectations of inflation. The key to counter-cyclical policy is that when the central bank reduces short-rates, the entire term structure should descend. If the central bank’s actions lead to a rise in inflation expectations and the long-end sells off, policy would be ineffective. 3. Conducting this exercise with headline inflation is even more useless. When inflation expectations are stabilized, pass-through from a temporary rise in prices (oil, primary etc) to core measures is limited. Headline inflation is quite variable everywhere in the world. Headline PPI is even more volatile. Central banks globally look at some core measure of inflation. Core is relatively stable and that is what should be looked at for policy purposes. Comparing WPI to core PCE deflator is like comparing apples to oranges. 4. Using the Taylor Rule for India has no economic rationale. How do you theoretically define an output gap and a natural rate of interest for an economy with infinite supply of labor on the margin? I could argue that India can grow as fast as it can accumulate capital. Inflation may be determined by capacity utilization, but in an open economy even that becomes immaterial since you can import. The country imports global inflation. Potential growth in this schema is determined by the sustainable level of current account deficit for a given level of capital efficiency. Constant returns to scale growth is possible and the natural rate in this case is determined by the efficiency of capital. I could be totally wrong. All I am saying is that let’s not trivialize extremely complex issues. But I have to see good theoretical arguments and econometrics devoid of economics cannot be a good first cut for policy-making in my book. We need solid theory before we can make these claims. I will stick to my basic points. * In interpreting what monetary policy is doing, it is the real rate that matters and not the nominal rate. * A lame estimator of the real rate is better than the nominal rate. Yes, of course, we should build better estimators of the real rate. What I would like most is to see a half decent bond market, featuring both nominal and real bonds, so that inflationary expectations can be backed out. Yes, of course, multivariate models will do better than ARMA models. Yes, all those good things should be done. Until they're done, this lame approach is the best measure for understanding what monetary policy is doing. "* In interpreting what monetary policy is doing, it is the real rate that matters and not the nominal rate." Until they're done, this lame approach is the best measure for understanding what monetary policy is doing." My comments: I do not agree. For the reasons mentioned in my previous post, this particular lame estimator cannot be used for gauging whether policy is expansive or contractionary.